HAVANA _ The head of the U.S. Chamber of Commerce has a prescription for communist-run Cuba's struggling economy: less government control and a heavier dose of the open market. 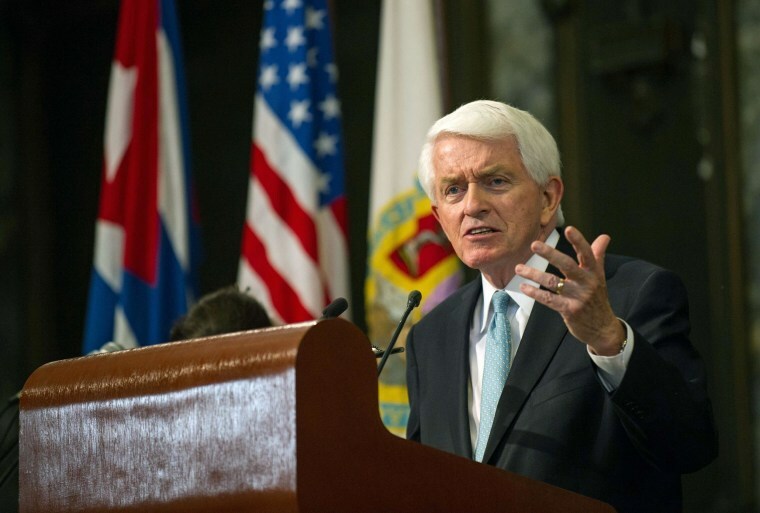 In the chamber’s first trade mission to Cuba since 1999, Chamber president and CEO Thomas J. Donohue cautiously praised what he saw during the visit to evaluate economic reforms that have hundreds of thousands of islanders working independently of the state. But Donohue also said in a speech at University of Havana Thursday that Cuba’s challenge is to consolidate and expand the changes. "We at the U.S. Chamber of Commerce believe in the power of private enterprise to help societies progress and improve," he said. "And it is in that spirit that we come to your country ... and offer these observations." Donohue and about a dozen business leaders who arrived this week met with entrepreneurs and government officials to talk about reforms begun by President Raul Castro in late 2010. State television reported Thursday night that Donohue met with Castro. It showed images of the encounter, but did not say how long it lasted or what they discussed. Island officials say they are not abandoning the socialist principles that have ruled here for more than 50 years, but rather are "updating" Cuba's model to perform better in a globalized economy. Donohue said the chamber has lobbied for years to end the now 52-year-long U.S. economic embargo that bars most commerce between the two countries. Some exceptions exist for food and agricultural goods, but as Cuba turned to other partners such trade has fallen by nearly half in recent years.